Masking tape art is an easy art activity to do with kids. An adult will place masking tape in random places across a canvas, before getting the kids to paint over the entire area. Therefore once the paint is dried, the tape is removed to reveal a colourful and effective work of art. While this activity looks simple, it is important to complete some preparation work in the days before, to achieve an eye catching and rewarding activity. Firstly, in preparation to begin the painting, one to two days prior, the canvas will need to have a base coat of paint. As a result of doing a base coat, the masking tape will adhere better. Hence reducing bleeding or leaking of the paint underneath the tape. When the base coat of paint has dried, place the masking tape over the canvas. 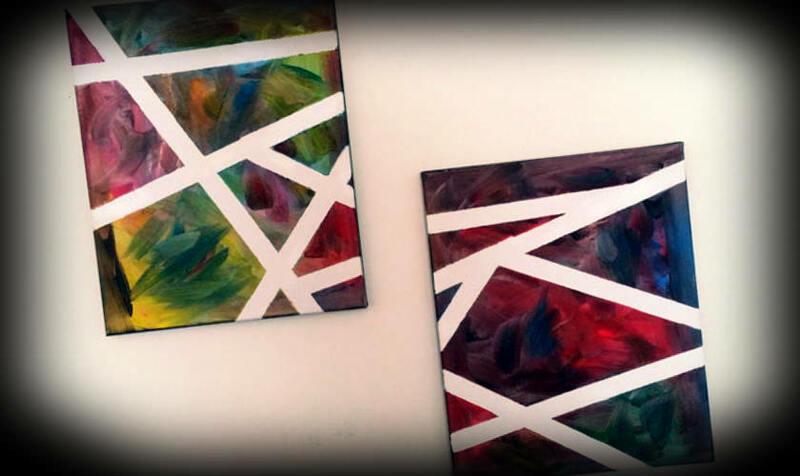 If you are painting more than one canvas at a time, place them side by side to allow the masking tape to cross over the different canvases. Furthermore, ensure there are no bumps or bubbles along the edges of the masking tape, and a Quality Masking Tape is used. In addition, using a quality masking tape is vital. Due to cheap brands not adhering to the canvas well, resulting in paint seeping underneath the tape and bleeding. Once the masking tape has been laid, the painting can commence. My kids like to mix their colours up until an entire artwork is a brown, greyish mess. Therefore I slowly introduce colours to them one by one, instead of providing them with every colour immediately. While this is an easy art activity for the kids to complete with little interference by an adult, encouraging them to cover the entire canvas with paint, the artwork becomes more eye catching. Finally, it is tempting to remove the tape immediately, by ensuring the tape is left in place until the paint has dried, the space left by the masking tape is more defined with no bleeding. After the paint has dried and the tape removed, a grown up can touch up any bleeds or leaks with the same paint used as a base coat. In addition, by giving the artwork a lick of pain on the sides of the canvas to tidy up the artwork, achieving a cleaner looking finish.